This entry was posted on January 9, 2018 by Jessica Anderson. Winter Classic, 10 years of soccer excellence! We are proud to provide championship soccer trophies, soccer medals, and pins to one of the nation's premiere soccer tournaments, the Pacific Northwest Soccer Club (PacNW) Winter Classic! This year is the 10th Annual tournament, held over the first two weekends in January 2018. More than 100 top youth soccer teams attend the tournament, its the premier winter soccer event in the Country! Over 100 college coaches attended the showcase, looking for future talent for their schools. The PacNW Winter Classic is based out of the the world-class Starfire Sports Complex, located just south of Seattle. Starfire Sports is the training home of the Seattle Sounders and features 11 fields of both natural grass and artificial turf. 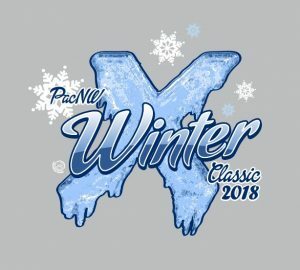 PacNW designs a logo for the tournament each year, and this year, in it's 10th year, features the roman numeral X in the design! All championship teams win the tournament's exclusive trophy, it is NOT offered on our website, we only purchase it for this specific event. Thank you to Executive Director Todd Johnson for trusting us with his tournament's award needs! It's an honor to be chosen as his awards vendor. Good luck to all the teams playing this weekend and have fun!